Indian streaming music service Dhingana says it now has 9 million unique users per month from around the world. As music streaming services around the world face down the international expansion of Spotify and Deezer, Dhingana CEO Rohit Bhatia says the startup is hedging its bets on a mobile-first strategy as well as growth in international markets. Over 75% of its users access its one-million song library from mobile devices, which the startup says marks a 200% growth year-over-year. 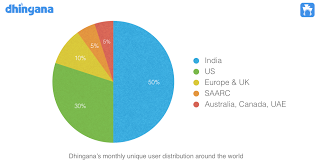 Dhingana, which is based in Pune, India and Sunnyvale, Ca., says half of its monthly active users come from outside of India. The U.S. accounts for most of that number, with 2.5 million users, while 1 million access the service from Europe and the U.K.
CEO Rohit Bhatia says Dhingana has achieve most of its growth from organic traffic and spends almost nothing on marketing. The service, however, faces several major competitors. Though Spotify and Deezer have not launched in India yet, both are focusing on international expansion and India’s fast-growing Internet user base presents an attractive opportunity. Dhingana’s main domestic competitors include Saavn and Gaana, both of which also want to leverage international growth. For example, Saavn, which claimed 10 million monthly active visitors at the beginning of this year, is taking a double-pronged approach to user acquisition by offering an English-language service for foreign audiences with a taste for Bollywood music while building its catalog of Western tracks for Indian listeners. Gaana, a music streaming service backed by Times Internet, one of India’s largest Internet companies, says international audiences make up a large part of its user base. Other Indian streaming music services include Raaga and MusicIndiaOnline.CO. Bhatia says Dhingana’s competitive advantage is offering a vast array of music for every language and region in India with tracks in more than 42 languages and genres. Dhingana’s cross-platform strategy is tailored for the country’s fragmented mobile marketplace, where featurephones still dominate but smartphone shipments are growing rapidly. According to Dhingana, its apps have been downloaded over 6 million times across Android, iOS, Windows 8, BlackBerry, Nokia and Amazon Kindle platforms. In addition to a mobile-optimized site, it also has Web apps for Opera and UC Browser, two of India’s top mobile browsers. Once users switch to smartphones, Dhingana sends a push notification prompting them to download the app for their operating system. Bhatia says Dhingana also focuses on search-engine optimization so its Web site shows up near the top of search results for popular tracks. The service currently monetizes through ads and a premium subscription service called Dhingana Gold, which is in a in-app purchase through its free iOS app. The startup raised a Series B of $7 million in October 2012 from Lightspeed Venture Partners, with participation from previous investors Inventus Capital Partners and Helion Venture Partners.